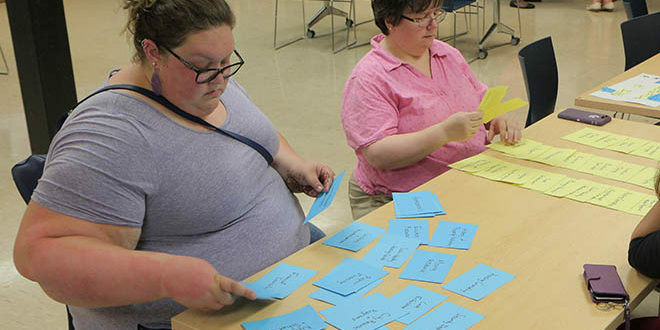 South Side pastors Beth Dubois and Dana Smith go through an activity during the iTeam's Ideation Session. 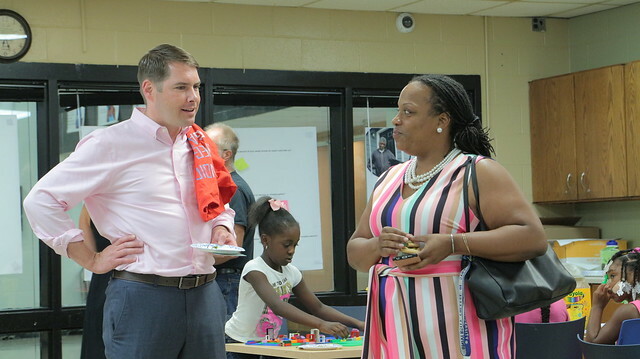 The city of Syracuse’s Innovation Team’s second Ideation Session brought residents together Monday, July 16, at the Southwest Community Center to share personal stories on the housing challenges they face. The session focused on three different aspects of housing stability: housing quality, housing costs and housing information. One of the posters in the session included the story of Jada, a 10-year-old resident of the South Side. Her family has had to move twice in the past year, and her mother’s previous security deposit was never returned. This seems to be a common struggle among residents from this area. “I think the South Side has concentrated poverty among folks who are African-American, while the West Side has a concentrated poverty for other populations too. I think just the concentration of poverty and everything that builds up with that — you have violence, poor schools, lack of access …” said Beth Dubois, a pastor on the Souths Side. Dubois also noted the multiple jobs that residents must have in order to pay for a crumbling home. These are just some of the current problems facing the city of Syracuse as the i-Team moves its focus to housing stability for 2018. The team reports to the mayor and is tasked to develop solutions to “Syracuse’s most pressing problems.” The team chooses a focus area every year and uses real data to create results. This year, it hopes to address the problems in every sector of the city in a holistic manner, creating various solutions for the community. After these session, the iTeam staff will review all the ideas and suggestions gathered. 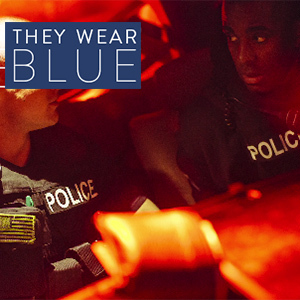 “We’ll be looking at them through a feasibility standpoint, then come out with a portfolio with initiatives,” explained Samantha Linnett, the program coordinator of the i-Team. Linnett noted it may take a few months per stage before these initiatives could be carried out. Currently, 33.6% of residents live below the poverty line in Syracuse, with only a 38.5% homeownership rate, which differs highly from 65.2% in Onondaga County and 53.8% in New York State. In the South Side, problems such as lead paint and poverty issues affect housing stability. Palmer Harvey, a co-chair of Tomorrow’s Neighborhoods Today Housing Task Force, believes that this is in part due to the lack of law enforcement. “People just do not know the law when it comes to these issues – if we target the laws first and make them stricter, we can have better housing,” Harvey said. Among Jada’s story, other posters shared real instances of Syracuse residents struggling to find stable and safe housing. Those present shared their own thoughts on how to address housing issues through various activities. Some people wrote out suggestions on notes and had sit-down conversations with members of the i-Team. 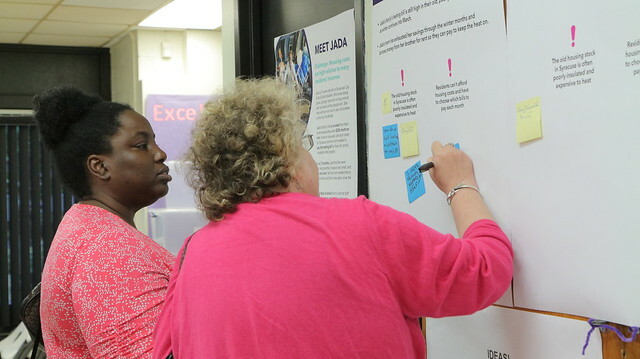 The final Ideation Session will begin at 5:30 p.m. Thursday, July 19, at 716 Hawley Ave.